I purchased this book myself and as always, my reviews are fair and non-bias. For budding costume designer Lola Nolan, the more outrageous, the outfit—more sparkly, more fun, more wild—the better. But even though Lola’s style is outrageous, she’s a devoted daughter and friend with some big plans for the future. And everything is pretty perfect (right down to her hot rocker boyfriend) until the dreaded Bell twins move back into the house next door. When the family returns and Cricket—a gifted inventor and engineer—steps out from his twin sister’s shadow and back into Lola’s life, she must finally reconcile a lifetime of feelings for the boy next door. I adored Stephanie's Anna and the French Kiss back in 2013 and knew that soon enough I would break and read Lola's novel, too. I was trying to spread Stephanie's novels out over a few months so I could read them not far off from each other (because this series is just, UH, addicitve and sweet....) but then I heard Isla's novel was getting pushed back until August...so I grabbed it off my bookshelf and started! I don't even know what was keeping me from reading them back-to-back, because as soon as started those first few pages...I was hooked. 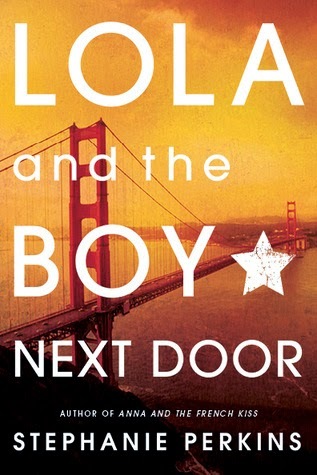 There are so many brag-able things about Lola and the Boy Next Door that it's going to be hard to keep this review so short and not give everything away! It is seriously one of those books that even though it's pretty popular in the YA community, it's a rare gem among others in it's competition, alike Anna and the French Kiss, Stephanie's first novel (and we do get some snippets from Anna and St. Clair! It totally surprised me and I loved how they fitted into Lola's story). Lola practically is fashion. She's always making new outfits and putting these awesome themed pieces together and not caring what people say about them. I imagine her as this girl with colourful wigs and a wild imagination that's hard to tame. Lola, at first, is skeptical when the Bell's move back into the house next door. The twins in particular - one; Cricket Bell, the boy who broke her heart and then left for years. Now he's back, she has a boyfriend, and things were about to get really awkward - but at the same time, blissfully magical - because, this novel...just completely shattered my heart and put it back together. Lola and Cricket's relationship takes a while to get back to a certain normality, I guess. It's hard for them because he knows what he did was wrong, just leaving like that, but their wires are crossed because of a certain interfering twin-sister; Calliope. But by the end of the novel, Stephanie sheds some light on her behaviour and to some extent, we can understand why she did things the way she did. Lindsay was such an interesting character and she brought so much to the story, even though she was just Lola's best friend. Lindsay is the kind of 'Nancy Drew' type who loved mysteries and solving things. I definitely saw her like a Nancy Drew-type character with depth, and not just another character fitted in. Max, Lola's boyfriend...there were three versions of him that spread out over the novel as Cricket re-entered her life. There was nice Max, who we saw at the beginning, although he was still kind of irritating. Then, there was off-Max, who was half-nice, half-bitter. We end with the I-hate-you-Max, because by that time, I did hate him. I'm so glad that Lola and him drifted, because they just weren't' meant to be - and I know Lola thought that he was her forever, but as readers, we know that isn't true, because there is only ONE person who fits Lola like a glove. Cricket Bell. They were written for each other and it definitely shows. And it sure was the best novel that I've read in a long, long time. Can I say all of it?! No? Okay then. Maybe all the parts where we get to hear Lola say about the writing on Cricket's hands, or the moon-and-stars scenes? And OH, that ending! Just so many amazing parts that finished that perfect jigsaw. Anyone who loves love. Or YA novels with sweet and unique characters. This book is for someone who wants to go on a sweet adventure with some bittersweet moments in love and life.